Marvel is about to enter Phase 3 of their ambitious cinematic crossover plans, and that means introducing us to some new characters. First off, obviously, is next year's Ant-Man, as well as characters like the Vision and Scarlet Witch in Avengers: Age Of Ultron. But in 2016, we're going to meet Doctor Strange. And there's a very good chance that he's bringing friends with him, if Kevin Feige's latest comments are to be believed. Kevin Feige spoke during a CineEurope event recently, addressing a few of their upcoming movies, particularly the good Doctor. "... There's a whole other side of the Marvel comics, which is that supernatural side - the inter-dimensional side of the Marvel universe, and Doctor Strange is, I believe, our entry point into that other realm, which has dozens of characters and storylines all of its own. So Strange is very, very important, not just because it's an amazing character study, and a journey of a man who's gone from this very arrogant surgeon to somebody who is quite zen and literally keeps all of reality together on a daily basis, but it also is going to open up a whole other side of storytelling for our movies." In other words, Doctor Strange should introduce a wealth of characters into the Marvel universe that aren't proper Doctor Strange friends or foils, but mostly solidify the firmament of the Marvel universe. 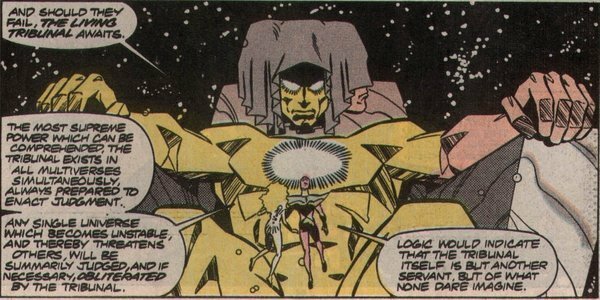 That could include extra-dimensional beings like The Watcher, Ego The Living Planet, the In-Betweener or even the Living Tribunal, one of Marvel's most inspired creations. Elsewhere, newly hired director Scott Derrickson discusses his interest in the character and that universe, talking about his chief inspiration for the movies. The answer involves not the more macabre stories (a surprise considering Derrickson specializes in horror films and has Deliver Us From Evil coming in a few weeks) but in fact the earlier material, because Derrickson is nothing if not a Marvel True Believer. "I think when you consider the work that I've done it makes sense that he'd be my favorite comic book character, at least in the Marvel universe. Probably the only comic character in that mainstream world that I'm suited to. I feel such an affinity for the character and the story and the ambition of those comics, especially the original Stan Lee and Steve Ditko Strange Tales - I think those are my favorite of all of them. The entire history of the comics is extraordinary." Someone is bringing out the Strange Tales! Marvel's Strange Tales ran from 1951 to 1968, at first specializing in outlandish sci-fi and horror stories before the superhero resurgence in the sixties. While the title spotlighted Spider-Man and the Fantastic Four, the introduction of Doctor Strange would split the difference. Here was someone who could freely associate with other heroes, but one who had his own cluttered backstory and evil enemies like Baron Mordo and Dormammu. Interestingly enough, Strange Tales would return a couple more times with interstellar stories involving characters like Adam Warlock and the original Captain Marvel. In other words, it's very easy to link Doctor Strange with Guardians Of The Galaxy, as Marvel maps out the spaceways in increasingly ambitious terms.